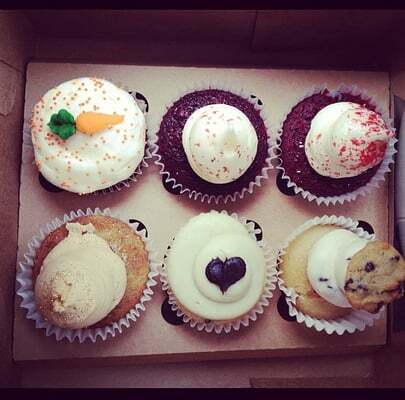 Ok, so we’re not going to lie, in our office, we’re all pretty big cupcake addicts (you are too, don’t deny it!). But how can anyone resist the temptation that is the miniature cake? Whether you’re a loyal chocolate fan, or you’ve converted to the red velvet or salted caramel camps, you are probably — like us — always on the hunt for that perfect cupcake. Fortunately for all you cupcake fans, our city has some amazing cupcake professionals working hard to create new varieties, and divine versions of your old favourites. To help you on your quest to find Brisbane’s best, we’ve made this handy list of our favourite cupcake bakeries. Go for gold, Brisbanites! This may be a small, home-based business, but Crumbs Bakery cupcakes are divine! Whether it’s a wedding, birthday or baby shower, celebrate in style with one of Deb’s delicious cupcakes. Each cupcake is created individually to suit the occasion (or if you just for you if you need a cupcake fix, stat!). Crumb’s Bakeries most sought after flavours include red velvet, fresh raspberry, chocolate hazelnut and Nutella (er, yum!). These little beauties are available by the dozen, leaving you with the tough decision of which two flavours to choose! Order online or call Deb for your own batch. Masters of the art of the New York-style cupcake Poppy Cakes cupcakes are available from The Baker’s Door, above Black Pearl Epicure. Their salted caramel cupcake is a must-try! Relatively new to the Brisbane cupcake scene, The Cupcake Patisserie is a big deal in Sydney and Melbourne, and now has a home in Westfield Chermside, giving all Brisbane’s north side cupcake addicts the opportunity to taste the sheer brilliance of their baked goods (and they really are brilliant!). Think sticky date, molten choc, tiramisu and strawberry swirl cheesecake. And just when you thought these cupcakes couldn’t get any better, they bring out the big guns. You can order a GIANT version of your favourite cupcake from The Cupcake Patisserie! Discover the greatness for yourself. You won’t regret it. Situated just up the road from the Racecourse Road precinct of Ascot, you’ll find Vanilla Pod. Well known for its scrumptious sweets and savories, VP is a must try when it comes to cupcakes. You can select one of their unreal cupcakes from the cabinet, or buy them made-to-order. Each cupcake is so beautifully decorated, I guarantee you’ll struggle to make the decision to actually eat one—they really are too good to eat. In our humble opinion Vanilla Pod make some of the best cupcakes in Brisbane! Situated in two convenient locations (West End and Bulimba), The Cupcake Parlour is one cupcake shop you must visit (seriously!). The Cupcake Parlour team cater for all your special occasions, and the cupcakes are also available for purchasing individually. Popular flavours include caramel fudge cheesecake, death by chocolate, Mr Jaffa and toblerone topper, just to name a few. Hungry yet? Our go-to for delicious (and gluten-free) treats! Botanica is situated in the beautiful Red Hill, and boasts some of the best cupcakes in Brisbane. Botanica provides a refreshing take on ‘fast food’, providing its customers with healthy, nourishing and downright delicious salads and baked goods. Cupcake’s at Botanica include the incredible vanilla bean, freshly crushed strawberry (these are our faves), cinnamon, and passion fruit. You’re going to be back to try them all, we guarantee it. This Brisbane institution on James Street is renowned for winning hearts with its fresh, buttery pastries, rich cakes (hello, chocolate roulade! and decadent baked treats. Popular flavours include raspberry, passionfruit, chocolate and vanilla with a zesty twist. The lovely staff at Jocelyn’s Provisions will be more than happy to help you decide which flavour to choose, but if the decision proves too difficult, just try all four! These are some of Brisbane’s best cupcakes and should be on any cupcake fans hit list.